I am a free spirit and I paint from my soul. I am not interested in showing exactly the person or the object in front of me, as they are, with their physical attributes only. I am after their essence, their energy. Therefore I use these shapes either as references or symbols, bringing their energy into the picture and I add colours to them to help evoking emotions. Because colours are amazing energy frequencies that impact us on all levels: physical, mental, emotional and spiritual, without our conscious mind being involved. It’s like having a soul to soul conversation via energy waves between you and the painting. When I see something that is emotionally moving for me, whether a shape of a tree or a couple kissing, or simply the colours of a sunset, I either take a picture of it for real or just collect these impressions in my mind. When I want to express an emotion or have a message to get across, I go back to these impressions and use the ones that match the energy of that emotion to create my artwork. I want the person, who looks at it to feel that emotion and be moved by it. As a self-taught artist I began my artist journey with “drawing my emotions”, expressing them with shapes and colours, using art as an outlet and stress release tool. However in 2016, when I started showing my artworks to my clients, I realised how they are moved by them emotionally and connect with their soul. My original profession is commercial economist, I have a university degree in this field. It is as far away from being an artist and energy therapist, as my native country Hungary from my adopted one, the UK. Before I left Hungary in 2005, I ran a print studio, as a family business for 8 years, where I have used my applied design skills, and got proficient using different software to create digital art. When moving to the UK I became a static web designer. A personal issue, i.e. being depressed, pushed me to find a different way of living. As a result I have learnt many different healing modalities from the best in the field, and in 2010 I have established my business, Spiritual Wonders, in holistic healing to help women, who are stressed, anxious, depressed, emotionally overwhelmed to balance their energies in order to become the best version of themselves. I learnt colour therapy, which helped me to understand colours as energy vibrations, and an energy medicine that can be applied through art. Since then I have experimented with different styles of drawing and painting, until I have found my own. Depending on the subject I am working on my style is a mixture of expressionism, figurative art, symbolism and sometimes I also create abstract art. My art is all about bright colours, movement and fluidity. When I am not painting I am a colour therapist. I adore colours. Adding colours can bring objects, and our surroundings to life. They are energy waves that not only have the power to shift our mood, but also affect how we feel physically and mentally. I am fascinated by this, and aim to paint uplifting, vibrant pictures, which are full of life. Acrylic on canvas. I apply the colours not only with brushes, but sometimes using my fingers, sponges, pieces of textiles, until I achieve the right expression on the canvas. Soft pastel on paper. I love working with soft pastels, because it is easy to mix the colours and create interesting effects. Again as a “hands on artist” I use my fingers to mix the colours. Digital Art. Sometimes I create it from scratch, other times I draw my idea with soft pastels and then scan the artwork and finish it digitally, adding light effects, and bringing together different drawings and paintings, almost like a collage. Claude Monet, French artist ( 1840-1926), impressionist . I wrote a book: Vibrational Healing with Colours & Angel Art in 2016, which includes 21 of my angel art paintings. It has been featured in the American Law of Attraction Magazine & LOA Radio Network, USA in 2016. Since then art has transitioned in my world from being one of the healing tools I offer to my clients to my passion. 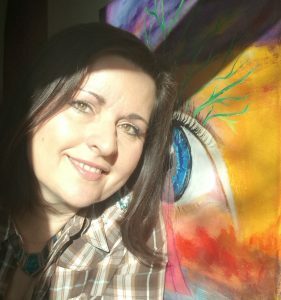 So I divide my time between creating art and carrying on with my holistic art services. As a participating artist in the Global Art Project for Peace I help creating world peace through art.